GUANGZHOU, China, July 23, 2018 /PRNewswire/ — GAC Motor, China’s fastest-growing automaker, is celebrating its 10th anniversary with the release of a new brand culture and brand essence, “The Road to Greatness”, heralding a new era in China’s automobile industry as they aim to push innovation beyond current limits. In the past year, GAC Motor launched a series of corporate brand and culture upgrading projects, which included interviews with key stakeholders, to re-evaluate the development of GAC Motor’s brand, core competitiveness, corporate culture and brand image. To face these challenges and to push development ever forward, GAC Motor has launched a new corporate culture and brand image aimed at providing a solid foundation for manufacturing, future product development fit for a global-scale operation. 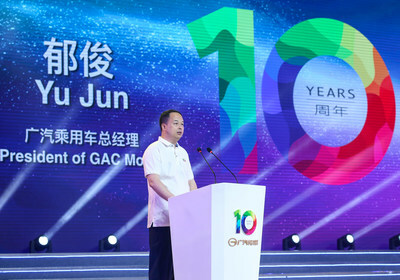 Yu Jun said as he announced the new brand culture and corporate values of GAC Motor under the brand essence “The Road to Greatness” during the event. 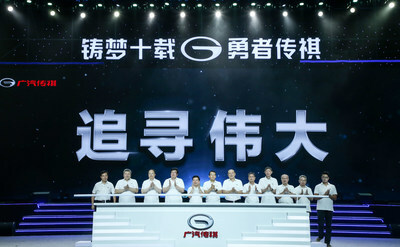 As the first self-owned brand of the Guangzhou Automobile Group, GAC Motor was established on July 21, 2008. 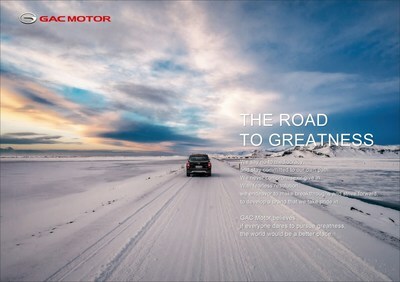 Over the past ten years, GAC Motor has gathered the world’s top R&D talents with the aim of creating a world-class manufacturing system; becoming the first Chinese automaker to cover the mid- to high-end sedan, SUV and minivan markets with a complete layout of luxury Class C vehicles. Standing firm on a strategy of ‘quality first’ to win the trust and credibility of customers, GAC Motor has ranked first among all Chinese brands in the J.D. Power Asia Pacific’s China Initial Quality Study (IQS) for five consecutive years. GAC Motor’s GS4 has been the highest-ranked Chinese domestic compact SUV in J.D. Power IQS for two consecutive years. Since its establishment, GAC Motor is actively participating in social projects. It has served as the official service vehicles for various international events such as the 2010 Guangzhou Asian Games and the 2017 Fortune Global Forum. In addition, GAC Motor signed a memorandum of cooperation with Sanjiangyuan National Park Administration and WWF on a project to co-build China’s first national park, aiming at realizing a harmonious co-existence between mankind and the nature. Internationally, GAC Motor has established a global sales and service network operational in 15 countries across Asia, Europe, Africa and the Americas, with R&D Centers in Silicon Valley, and Los Angeles entering into operation in 2017 and 2018 respectively; Showcasing their R&D achievements and latest products at international auto shows such as NAIAS, GAC Motor also became the first Chinese brand to present at NADA, demonstrating to the world GAC Motor’s promotion of internationalization. “GAC Motor is a company on the move. The successes of our first 10 years have laid the foundation for our next phase of development,” said Yu. “Our goals for next decade will be driven by our core values, ‘Dare to dream, have courage and keep striving’. ‘Dare to dream’ is to forge ahead with the goal of being the leader in our industry; ‘have courage’ is to take the responsibility to build top cars for our consumers; ‘keep striving’ is to keep up momentum with continuous progress”. Founded in 2008, Guangzhou Automobile Group Motor CO., LTD (GAC Motor) is a subsidiary of GAC Group which ranks the 202nd among the Fortune Global 500 companies. The company develops and manufactures premium quality vehicles, engines, components and auto accessories. GAC Motor has now ranked the first among all Chinese brands for five consecutive years in J.D. Power Asia Pacific’s China Initial Quality Study SM (IQS), demonstrating the company’s quality-centric strategy from innovative research and development (R&D), manufacturing to supply chain and sales & services.